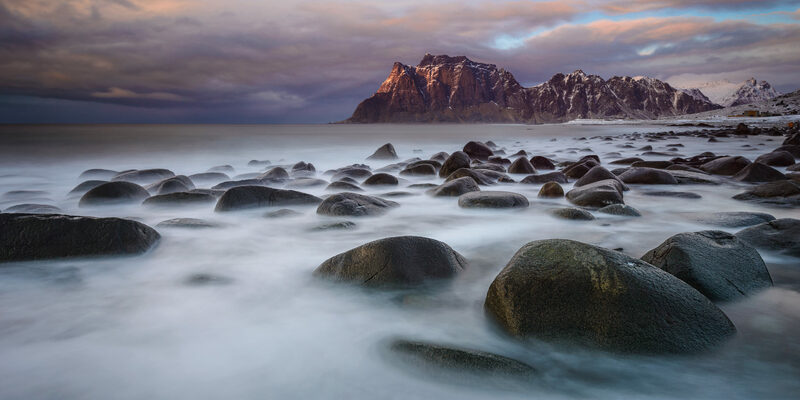 Directions: This popular spot is nestled in the Lofoten Islands of Norway. You can fly into Oslo and take an internal flight via SAS airlines to Leknes which is the nearest town. From Leknes, it is about 20 minutes out. Follow the E10 out of Leknes and turn right onto Vikveien. Then take the Fv826 to Uttakleivveien. At the intersection, take a left to stay on Uttakleivveien until you see a parking area on the right and the beach right next to it. This is a popular beach for landscape photography and is located in the gorgeous Lofoten Islands of Norway. 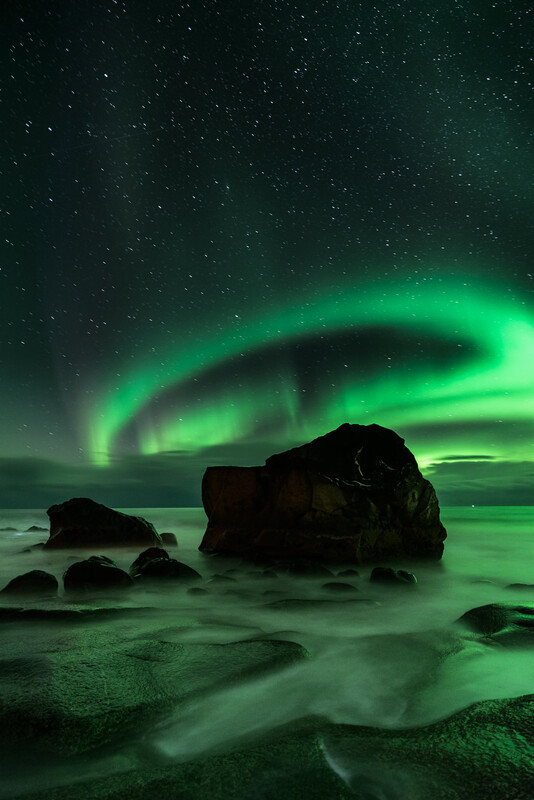 This rocky beach is a great spot for seascape photography as well as Northern Lights photography. It is beautiful all through the year but packs added beauty during the winter months. It is a great evening spot as the last light of the evening falls on the fjord right across from the beach and adds a lovely quality to images. In the winter though, most of the food outlets close so it can be hard to find cafes or a hearty meal after. The winters are magical for photography but the summers is definitely more accessible and perhaps the fall offers the best in-between option. 1. 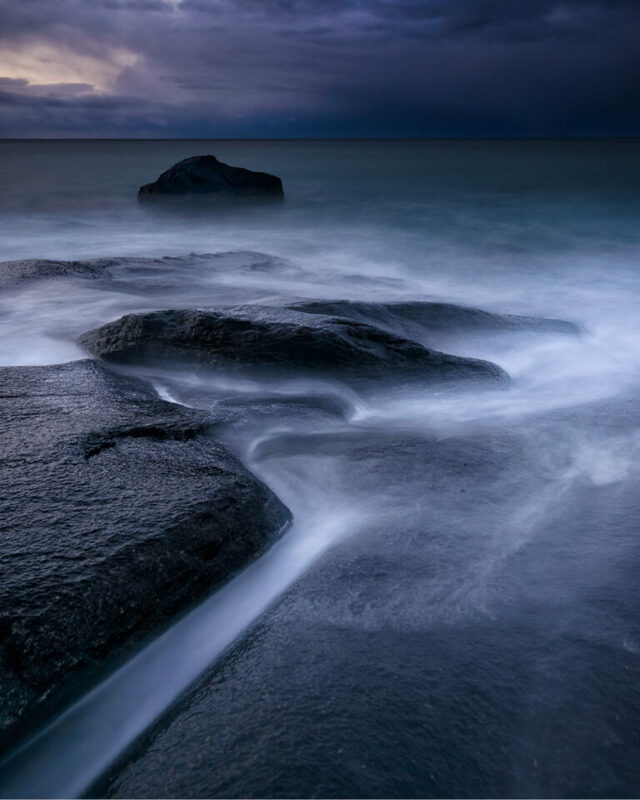 Getting to the rocks makes for some dramatic seascape imagery but be careful- it is very slippery and the waves can pick up intensity and make you lose your footing. I had boots reaching over my ankles and I was lucky to not get too drenched. Having a 2-stop graduated ND filter will help to balance the sky and ground while shooting during the day. 2. A good fast wide-angle is essential to shoot the Northern Lights. A manual focus lens such as the ones from Zeiss are great because you can crank the focus wheel all the way to the end (infinity) and shoot away. Autofocus lenses don’t have a hard-stop at infinity so you may have to pre-focus to be sure.